Waingapu is a sprawling town. The oldest part of town is around the old harbour. There it is rather cosy. There are many small shops. In the evening fishermen sell their catch. 1 km further south is the new commercial centre with market, gas station, hotels, and banks. Between the 2 parts and within the town area you can still find bicycle rickshaws. The town has only a few multi-storey buildings. Oversized administrative buildings with blue corrugated tin roofs and brightly painted sculptures are on the hill towards the south. At the eastern end of the hill is the PC Corner restaurant. From the upper floors you have a great view over the city ... and with a good view up to Flores which is 80 km north. At the central crossing next to a small park, a plastic palm tree shines at night in constantly changing colours. Muslims have settled around the mangrove shore. Christians and newcomers settle inland and along the irrigated river valleys. Often they settle according to their former origin and often Ikat is produced there. The old harbour and the mangroves shore are highlights for visitors. When you leave the main roads, you immediately come to residential areas with individual houses and gardens. Everywhere in between are small workshops and stores. From many hills within the town area you have fantastic views - the colour changes from terracotta tones to rich green areas - brightly decorated churches, flashing, domed mosques, and the pointed roofs of corrugated tin protrude. Half way between town and airport, to the inland, is the traditional royal village of Prailiu. From the originality it is unfortunately less worth seeing as other traditional villages in the area. But women are weaving everywhere. You can look at the manufacturing process, and maybe buy some woven fabrics. A nice half day trip is along the Kambaniru (Kambera) river inland. Behind the irrigated lowland you get to the Kambaniru (Lambanapu) dam. 1 km behind the dam is a restaurant on the top of a mountain. From there you can see the beautiful green river valley. Further on, past some traditional villages like Bibi Praing, the paved road ends at a river bridge. On the other side is the village Kiritana. You can hike up the prepared road further on behind the village and will have a great view. Everywhere is lush greenery of the valleys and irrigated fields with rugged limestone cliffs and round hills, which are green or brown depending on the season. Please keep away from the river, everywhere there are crocodiles of great size. There have been many accidents. Another scenic trip inland branches off from the road to Waikabubak at a curve to the Mbata Kapidu. Passing numerous small settlements in the deep green valleys, the road increasingly gets worse and ends in unrecognizable trail in Luku Kamaru. A longer Inland Tour begins at the bridge before the airport and leads to Maidang. First you will go along the rice fields of the irrigated lowlands, then up to the mountains. 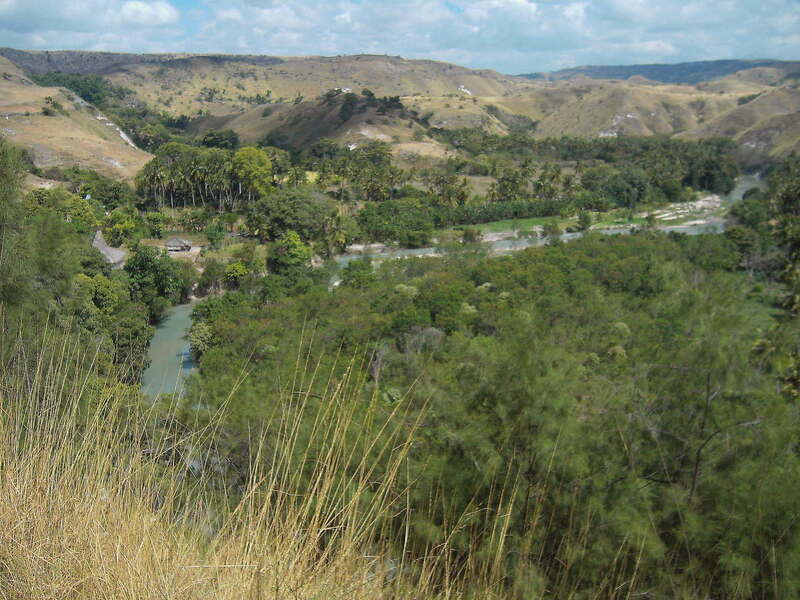 From the top you have great views of the river canyon of the Kambaniru River. Half the way it is worth a detour to Maradamundi village. From the village there are a few paths down to the river ... but no bridge via that you could get back to Waingapu. In Maidang you can continue either over the motorcycle suspension bridge to the south or walk through the river to the west. At Lumbung on the other side of the river you get to the waterfall Koalat. Those who want to cross Sumba at this point, have to walk via an unexplored mountain hiking trail, through the uninhabited highlands for about 15 km and 500 meters ascent before you reach the next road at Kukitalu. Those who are only a few days in East Sumba, could do the following tour with motorcycle or by car: Waingapu - Melolo - Kananggar - Taramanu - Waingapu. 6 hours driving on a , in parts, rough road, but altogether a good overview of savannah, jungle, and mountain area, with many traditional villages. A few kilometres northwest of town the beach begins and ends more or less at the northern tip of Sumba. It is interrupted for at least two-thirds by mangroves and rocky sections. At high tide you could swim in sandy areas, but the area is very dry and there is only little shade and no infrastructure. The sea is either crystal clear turquoise or murky brown depending on wind and waves. The further you get away from town, the cleaner are the beaches. A fenced shady area called Londalima is located 12 km from the town, for the people of Sumba it is more of a picnic place. About 32 km from town is Kambera (Purukambera), the beach is better and you can snorkel. In Pantai Cemara you can stop off. East of Waingapu the water is shallow and there are many mangrove areas. In between, there are 3 nice and clean beach areas near the villages of Kawangu, Watumbaka and Walakiri - where you can swim well at high tide. They are between 3, 5, and 14 km past the end of the runway of the airport. The road is usually about 1 km from the coast, so you have to ask for the way. After about 15 km you come to a junction with sign Pantai Li'ie. This is a beautiful private ground with 2 small beaches and a house with open sleeping floor. Shortly after it, a branch goes to Laipori Beach. It is not worth visiting this rough beach. Here arise the first post-colonial villas. At all beaches around Waingapu you have to keep a safe distance to river mouths and mangrove areas there might be crocodiles. Ask locals if the area is safe before venturing into the water!